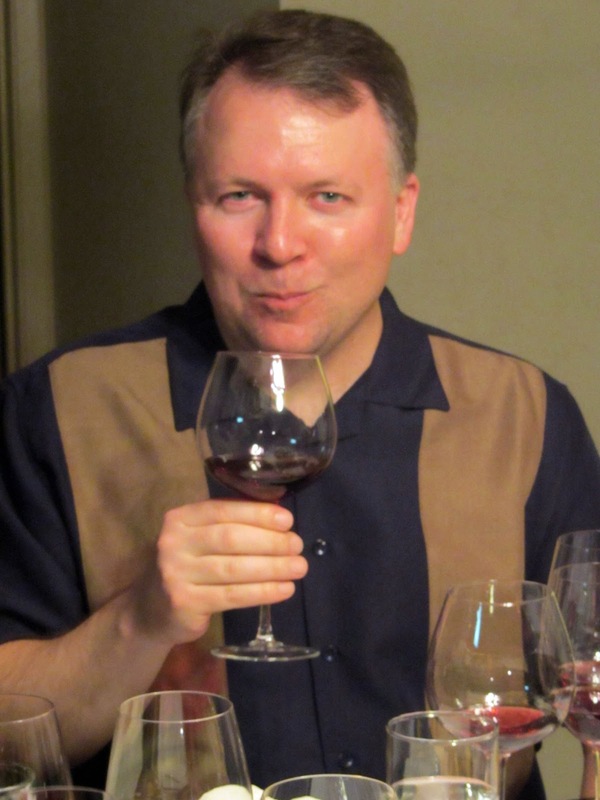 The Accidental Wine Snob: Would you like some Wine with your Coffee? Sangmok and his wife Kyonghee joined us for an intimate Pinot blind tasting back in January. Sangmok had heard the talk about blind tastings at lunch and had been dying to give it a try. I asked Bob and Carolyn to join us. Carlos was looking for something to do, given his family was out of town, so he joined us as well. 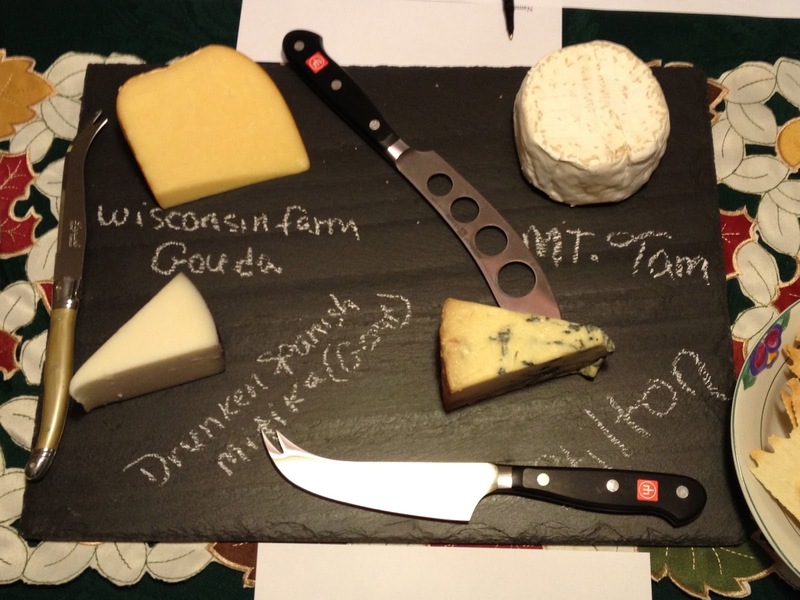 Cheese plate and 4 glasses of Pinot, what more could one need? We tasted, discussed, and enjoyed each other's company. D - 2009 Flowers, Somona Coast came in first place with an average of 3.73. Sangmok and Kyonghee brought this. It cost $43. C - 2008 L'Attitude 39 Degrees, Sonoma Coast came in second place with an average of 2.89. Carlos brought this. It cost $20. A - 2008 Skov Winery, Santa Cruz Mountains came in first place with an average of 2.80. Sue and I brought this. It cost $26 from the winery. 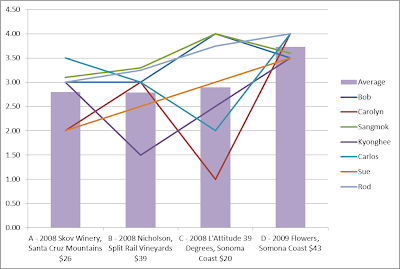 B - 2008 Nicholson, Split Rail Vineyards came in first place with an average of 2.79. Sue and I also brought this. It cost $39 from the winery. Sangmok and Kyonghee's first time out and they knocked it out of the park. The Flowers was a great choice! 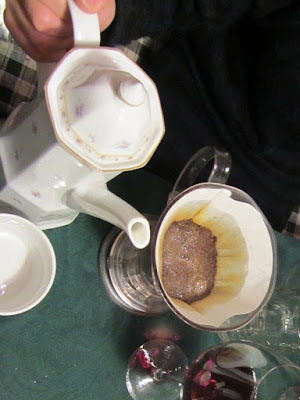 After tasting, Kyonghee, our resident coffee expert, made a scrumptious pot of coffee using Rwanda coffee from Wracking Ball Roasters and the "pour-over" method. Everyone that partook loved it and was impressed with her knowledge of coffee.